(left to right): TACTICAL VIEW OF THE BOMBARDMENT (LEFT). 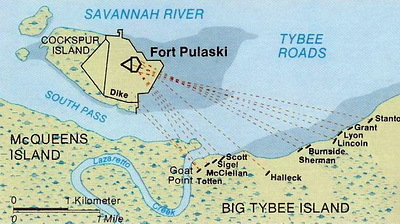 Note the orientation of the fort relative to the Union batteries on the shore of Big Tybee Island. Most of the shots were aimed at the southeast corner. Union batteries were named after famous military personalities, one after President Lincoln. STRATEGIC MAP OF THE ATLANTIC COAST (MIDDLE). This map shows the major coastal forts of the Third System developed during the first half of the 19th Century. All were brick masonry forts that were designed to effectively defeat smoothbore solid shot. They proved to be entirely ineffective against rifled solid shot. CONFEDERATE DEFENSES AND UNION BOMBARDMENT EFFECTS (right). 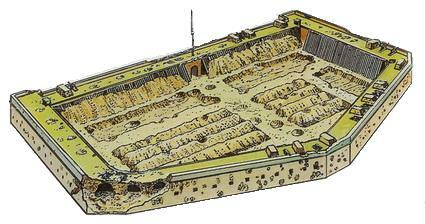 All of the casemates are covered with timbered blindages, a French word meaning "armored" but in this case timbered. Dirt from the trench in the parade ground were thrown up against those casemate areas likely to be struck by Union shot and shell. The trenches were designed to catch and prevent shot and shell from rolling against a casemate. 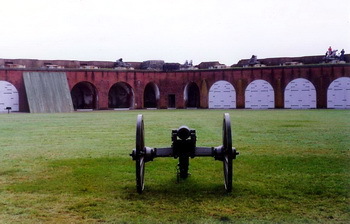 Note the left corner of the southeast wall that was breached and threatened penetration into the fort's magazines. This caused the immediate surrender of the fort after a 30-hour bombardment. 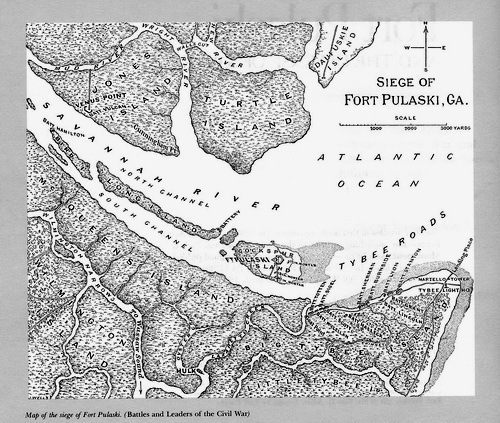 These three images taken from the Fort Pulaski Official Map and Guide2. 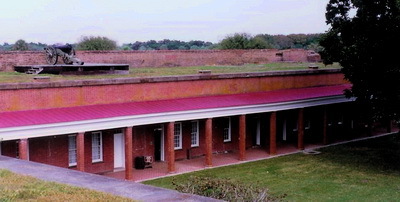 FORT PULASKI ENTRANCE. 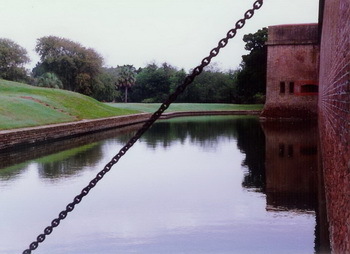 These two photos were taken to the left and right of the draw bridge at the rear or west face of the fort across from the triangular demilune that protected the land side of the fort from infantry assault. 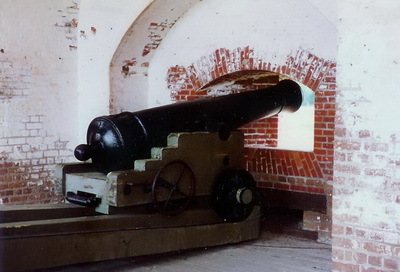 INTERIOR OF FORT PULASKI. This photo shows the open casemates, casemates with the wood framed coverings painted white, and the lone standing blindage representing how each casemate was covered during the bombardment. Earth would have been piled up against the blindages to absorb the impact of a direct hit and protect against shell fragments. Note the tourists on the far right and how exposed they would be to exploding shells. The corner in the background is the point at which the northeast and southeast walls meet. ARTILLERY: The left photo is a large smoothbore gun in casemate on a limited traversing carriage. The right photo is a 30-pounder Parrott Rifle. 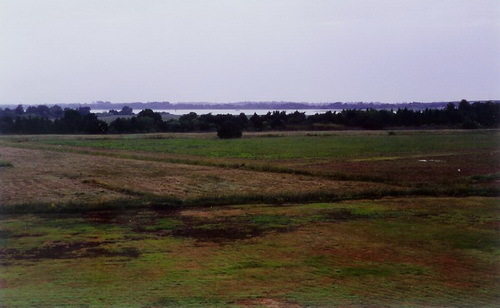 VIEW OF THE TOPOGRAPHY: This photo was taken from the southeast rampart to the South Pass beyond which is Big Tybee Island where the Union artillery batteries were placed, most of which are out of view to the left. 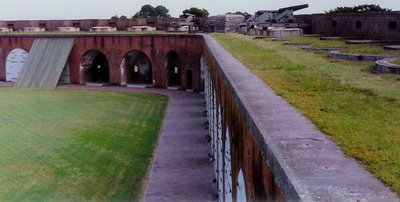 The ground is relatively flat and the fort was situated on Cockspur Island from which it could protect the entrance into the Savannah River. 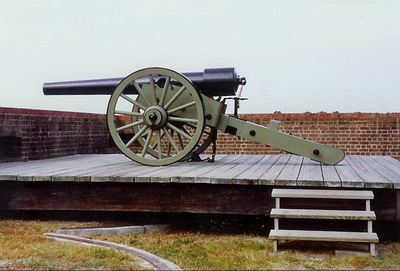 SIEGE OF FORT PULASKI. This map from Battles and Leaders of the Civil War5, is post-war. There were 11 Union batteries with the following guns and ranges in yards. Unfortunately, I was not able to match the names to the battery numbers given in Battles and Leaders of the Civil War. 1 Fort Pulaski National Monument, Tybee Island, Georgia, postcard FP-3, published by Coastal Photo Scenics, Southwest Harbor, Maine. 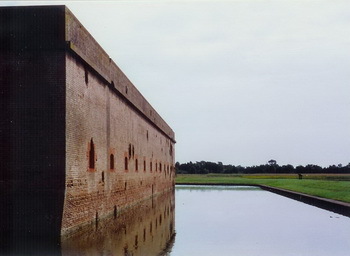 2 Fort Pulaski Official Map and Guide, Fort Pulaski National Monument, Georgia, National Park Service, U. S. Department of the Interior. 3 Lewis, Emanuel Raymond. Seacoast Fortifications of the United States. Annapolis, Maryland: Naval Institute Press, 1979. 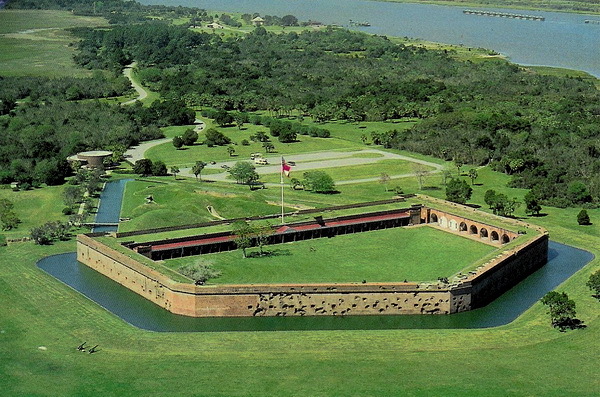 4 Julian, Alan P., Fort Pulaski and the Defense of Savannah. Eastern Acorn Press, reprinted from Civil War Times Illustrated Special Edition, 1990. 5 Johnson, Robert Underwood and Buel, Clarence Clough, co-editors. Battles and Leaders of the Civil War. New York: Thomas Yoseloff, 1956.